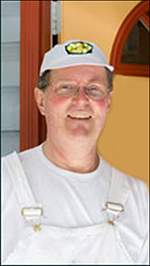 Oliver has been painting and decorating homes and small businesses in the Comox Valley for 30 years. Known for high quality craftsmanship and personalised service, he has developed a core group of clients who call him back again and again. Referred by friends and real estate agents, Oliver works for newcomers to the Valley, often communicating via the internet using digital images of the project in progress. He highly recommends the services of Michele Courtney at Ocean Pacific Realty. He has worked closely with Michele and he is really impressed by the genuine care that she gives her clients. Oliver and all of his employees are insured for workmanship and covered by Work Safe BC (Worker's Compensation). If necessary, all are bondable. They are also insured for workmanship and are covered by WorkSafe BC. Oliver's daughter Erin apprenticed with her dad and worked in the business for ten years. Unfortunately, due to health concerns, Erin has had to withdraw from active participation. She will be missed by Oliver, the crew, and Oliver's customers.